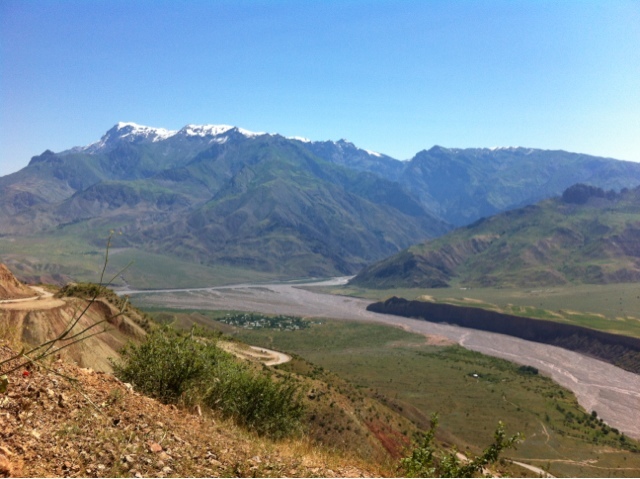 The road climbed out of Kulyab and soon turned to dirt. A few kilometers of careful riding and we arrived at this spot on the river that forms the border in these parts. The other side of the river is Afghanistan. The secret to navigation for the next week or so is to keep the river on the right. DO NOT CROSS IT. Though not a long day it was very challenging. Short stretches of tarmac were broken up where landslides have crashed down. Elsewhere it was dirt, rock and packed sand. The road is one lorry wide and squeezes onto a thin ledge cut into the near vertical valley side. You are quite literally between a rock and a hard place. There is not a lot of traffic but what there is is a succession of large Chinese trucks carrying materials and supplies to the construction crews. The rule of the road is - get out of the way. The lack of recent rain meant that the feared river crossings were easier than they might have been. Still, riding through the shingle of a river bed while surrounded by 200 sheep and goats is pretty tricky even without the water. By next year both the rivers will be spanned by the huge blue steel bridges that are almost finished. This evening we are at a small home stay in Kalaikhum. The town is built on the confluence of two rivers that crash through at tremendous rate. Dinner (lamb soup, chicken, rice, vodka) was served on a balcony perched above the torrent. Looking across at the similar cafe on the other bank we laughed at how rickety the structure was. Then we saw that ours was the same. Gulp. Away from the light pollution of a large town we had our first good star scape. We climbed the hill behind the home stay and sat back spotting satellites, shooting stars, planets and constellations. And then to bed "Underneath the Stars" with Kate Rusby on the iPod. Perfect.